When people prattle-on about tax, it is mostly made from ground-level, with a focus on tax rates. When my most rabid libertarian friends weigh in on the subject, discussion extends to the moral realm. Some of these debates are constructive, a few downright stimulating, though most such arguments descend into demagoguery that take kernels of truthy-sounding platitudes about freedom, and the morality of taxation’s coercive nature, profoundly at odds with the sensibility and logic of the entente that secures from the hordes the very property from which they derive their benefits. Those benefitting most from the secure property rights might be forgiven for conceptual ignorance – introspection being a scarce commodity amongst the wealthy – but the vociferous and cynical denial of the asymmetric benefits of securing property rights, both intra- or inter-generationally, whether due to some combination of attribution bias, feigned religious belief, or simple greed is less excusable. In a new gilded age, the idea that the rule of law is vastly underpriced by those who benefit most should be anything but contentious. Few doubt we humans are animals. Few outside the most fundamentally-religious wing-nuts would doubt that our social, political, and economic structures as well as our mores, values, responsibilities to others are, for the most part, man (and woman) made. We have done so NOT out of altruism, but out of BOTH necessity and expediency, whether collectively agreed or imposed by force. They have evolved hand-in-hand with the ascent of civilization. And they have contributed handsomely to the progress and advancement of the species. Some more than others, indeed, but it’s difficult to argue against their importance, and resulting increase in overall economic welfare derived from the general rule of law, and attendant property rights conferred. So why is it so seemingly difficult for the uber-beneficiaries of the rule of law to reconcile their (mostly fiscal) responsibilities to the entente with The People which is the very fount that allows them, and increasingly one might argue, their less-deserving progeny, to maintain a position in the stratosphere of power and control, with a recognition that the very legitimacy of their reign is conferred by The People through the rule of law? Indeed, the more remote this concept becomes, the greater the probability that the entente and rule of law itself corrodes to the point where mob rule, or some equally nasty alternative somewhere along the continuum of possibilities, will emerge. In the absence of the entente, with its benign rule of rule, entropy typically yields either unpleasant and economically sub-optimal forms of authoritarianism or the so-called law of the jungle. We have seen many faces of authoritarianism, and rarely is anyone content outside the authoritarian himself and immediate cadre. And while the classical expression may have been militaristic. modernity increasingly enables dystopic Atwoodian visions of The State, captured by narrowly-powerful economic interests, employing all manner of surveillance technology and distortion of law, to maintain and consolidate their power and control. At the other pole, Libertarian and conservative morality, questioning the very nature of the entente, and undermining the edifice upon which is rests, philosophically descends into a chaotic, Darwinian jungle. By calling into doubt the existence of the entente, they are, in effect either relying upon something magical (thin of Dawkin’s “skyhooks“) to maintain their place at the pinnacle of power and control, or, they are, in their neglect, saying: “Bring it on…!!”. To make my point, one should consider an example from the animal kingdom, where competition, rule and survival of the fittest reigns in its purest, and most unadulterated form. The sea-lions of Galapagos would, for this purpose, be archetypical. Picture a kilometer-long idyllic beach. Waves rolling in from a cool, deeply-sapphire ocean, under a shining sun and a stiff breeze. 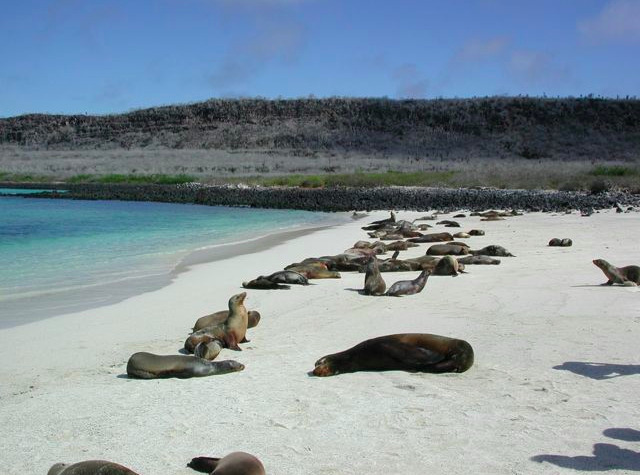 The sea-lions share the beach and nearby shallows with others (birds, lizards, dolphins etc.) but the sea lions dominate. When not feeding, they mostly lay about in the sun. They have no rule of law, per se. But they certainly have structure and custom. A dominant male sits atop the herd, and occupies the choice real-estate on the beach, surrounded by a scattered harem of females each with their pups. He is known as the beach-master and is typically the biggest and baddest sack of blubber around, which is how he became beach-master. He protects his harem, and his reward (apart from the privilege of residing on the choicest beachfront real-estate) is the right to mate with the cows and sire progeny. He is truly master of the universe….for the moment. As the male pups grow they go from being tolerated to marginalized. They play in the waves in sight, but staying out of the way of the BeachMaster. They practice their intimidation and battle skills with the other pups and larger, older males, also marginalized. Occasionally, they sneak on the beach. Try their luck with the randier females when the Beachmaster is sleeping or otherwise engaged. But a scowl from the Big Bull and movement in their direction is often sufficient to shoo them away. Sometimes the growing pups coordinate and move to opposite ends of the beach presenting a dilemma to the Beachmaster to their advances. But they, too are eventually stared down. The largest ascendant bulls periodically challenge the Beachmaster, not infrequently, outright, or by trying to seduce one of his harem. This is a classic duel, and only one will win. Usually it is the fittest which is often the largest and strongest. Initially, this is likely the Beachmaster. But, it is very tiring work without the rule of law. While the cows and pups lounge idyllically, the BeachMaster is defending his turf. There are NO property rights. In this realm, the rule of law is the rule of the Beachmaster for as long as the Beachmaster can maintain it. So stressful is it to remain Master of His Universe, being continually on guard, and warding off challengers, his reign is terribly short. There is no entente to secure his property rights. Nothing is assured to HIS prodigal pup. It is literally, the law of the jungle (beach). This provides some perspective to the natural state of the world without the Rule of Law. The mob, as they have done in the past, will take what they wish, when they wish it. Because, at certain junctures, they can. There is nothing, other than the rule of law, to prevent those that are powerful, or can organize the power of others, from taking it. The [benign] rule of law preserves, consolidates, and institutionalizes power so all things that benefit therefrom can blossom, including its own persistence. For it to work, the rule of law must nearly be universally accepted, which is not a hard sell – since its benefits are, even in its weak form, profound and widespread. One need only look at extreme failed states such as Somalia at one end, or North Korea at the other, should one have any doubts. Reality, of course, is a continuum of possibility in-between: from fascism, fragmented rule by war-lords; including a corporate police state. But make no mistake: as a social construct there is an implicit contract – a ceding of some things in exchange for some other things. THIS contract, unlike many others facilitating the rule of law, while man-made, is unwritten. We may under-appreciate its nature during good times, but it will be evident should it dissolve. Particularly virulent deniers and those self-interested proponents of regressive fiscal regimes may contest that the law of the jungle, or authoritarian imposition of power is the entropic outcome. However, it seems to me that such arguments will deterministically assume away the asymmetries and rigidities that prevent the law-of-the-jungle competition, whilst protecting the benefits of the rule of law. It is at this nexus where the value of the rule of law should rightfully enter the equation. The boundaries are necessarily wide. There is no single formula. But it seems that detached economic observers can identify whether prevailing policies and their outcomes are moving the nexus towards, or away from, some approximation of the point at which the entente is becoming more stable or less stable. This is intricately tied to the debate on inequality and the opportunities for mobility, and whether the rule of law itself errs on the side of greater fairness, or greater parochial interest to, and institutionalization of, the super-beneficiaries of the rule of law. It is worth noting that the beneficiaries of the modern gilded age are not as mean-spirited as say, for example, the Russian landowning aristocracy was to their peasants. Few knowing observers shed a tear for what befell them. Nor is the plight of today’s disadvantaged as dire as it was historically. Admittedly, this is not setting the bar very high, and it ignores the profound change in the direction of outcomes over the past three decades. Most alarmingly, in the big picture, it appears as if modern-day super-beneficiaries have privatized the benefits of the rule of law, while more or less continuously diminishing their [mostly fiscal] responsibilities to finance it. THAT, in itself, says volumes about how much they collectively value the entente, or how ignorant they are in respect to its very existence. That is a great shame. Not because I worry for the future welfare of those deriving the greatest benefit, but because of the coarseness, and alienation it creates amongst the great majority of people, and the corrosion of that singularly-most-valued man-made creation, The Rule of Law.